For [Peter]’s entry for the 2015 Hackaday Prize, he’s attempting to improve the standard industrial process to fix atmospheric nitrogen. Why? Fertilizers. He’s come up with an interesting technique that uses acoustic transducers in a pressure vessel, and to power that transducer, he’s turned to the greatest scrap heap in the world: eBay. He found a cheap ultrasonic power supply, but didn’t know offhand if it would work with his experiments. That’s alright; it’s a great opportunity to demo some basic reverse engineering skills. A few months ago, [Dave Jones] posted a great video where he reverse engineers the front end of the new Rigol Zed. The basic technique is to make a photocopy, get some transparency sheets, grab a meter, and go to town. [Peter]’s technique is similar, only he’s using digital image manipulation, Photoshop, and a meter. The process begins by taking pictures of both sides of the board, resizing them, flipping one side, and making an image with several layers. The traces on the bottom of the board were flooded and filled with the paint bucket tool, and components and traces carefully annotated. Looking to spice up his living room with some modular plastic pieces, [Quentin] came up with a way to take digital pixels and convert them to LEGO building plans. 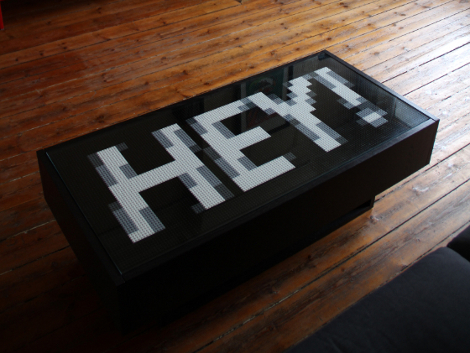 The end result is a coffee table top that uses a font complete with anti-aliasing. The first thing he did was figure out physical dimension and color palettes available from the popular building blocks. His search yielded all of the answers after he spent some time on Brickipedia. Armed with that knowledge he started bargain hunting, settling on a brick size that yielded adequate resolution without breaking the bank (he budgeted 87 Euros or about $125 for materials). From there he used Photoshop, along with a custom color palate that matches the LEGO colors, to generate the design. Image in hand, he finished the planning stage by writing a program to count the pixels, convert them into LEGO bricks, and spit out an order list and build instructions. He’s saving others the trouble of doing the same by releasing his source code. Of course the project wouldn’t be nearly as fun if he hadn’t made a fast-time build video. We’ve embedded it after the break. 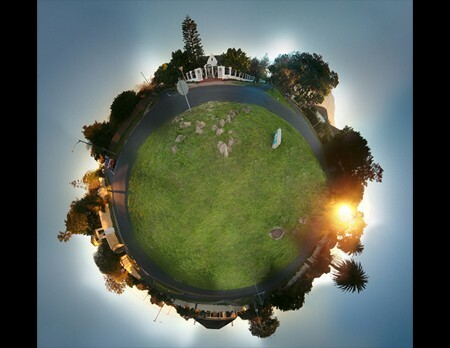 Reader [alex] had a commercial plugin for fisheye lens correction and wondered exactly what kind of magic was behind it. Was it actually doing line detection? He dropped in a square grid to see what it spit out. The warped result indicated that the transformation was completely independent of the photo’s content. Using this result as a guide he was able to create a similar transform using Warp and save it as a script. The script generates almost identical results and now he knows exactly how little magic is involved.